Hewlett-Packard (s HPQ) canned CEO Leo Apotheker because of communications and execution miscues, not because of his grand strategy for the IT giant, said board member Ray Lane. Apotheker’s goal of pushing HP into higher-margin enterprise software and cloud services remains valid and Lane, HP’s newly minted executive director, and new CEO Meg Whitman said they are aboard. But they left themselves wiggle room. “I am supportive of the actions announced on Aug. 18, but I am now deeply involved and will review the initiatives,” Whitman told reporters and analyst on a conference call Thursday night. Aug. 18 will go down as Apotheker’s Waterloo. It was the day of the third-quarter earnings call and when Apotheker confirmed reports that HP might divest itself of its Personal Systems Group, its PC operations. Lane said the Apotheker regime was marked by a lack of teamwork. “We didn’t see an executive team that was working on the same page,” he noted. Indeed, HP sources said the news that HP was thinking about divesting its huge Personal Systems Group was not shared with key top-level execs until just days before the announcement. Also of huge concern to Lane is criticism that Apotheker’s cloud-and-software pitch, which started in earnest last March, devalued HP’s hardware birthright. That firestorm erupted again with the Aug. 18 news that HP would buy Autonomy Corp., a little known enterprise search company, for more than $10 billion. Big HP enterprise customers — companies that buy their PCs and servers in bulk — were not amused, as Lane and others quickly found out. He acknowledged hearing “vividly” about these concerns from analysts and customers after the August earnings call. While many were glad to see the last of Apotheker, early reaction to Whitman as his replacement is mixed. On the plus side, at least HP communicated the changes clearly and fast, said one HP customer and partner, who requested anonymity because he works closely with the company. That was certainly not the case in the messy Mark Hurd-to-Apotheker CEO transition, he said. On the whole, however, he thinks HP should have looked outside its boardroom for its CEO. 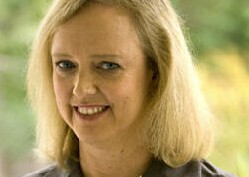 The perception that the HP board is dysfunctional means any CEO from that board is suspect, he said. Lane defended the board strongly in his comments Thursday, stressing that it was not the board that pretexted (spied on reporters) or handled the Hurd ouster. Others aren’t buying that, pointing out that many of HP’s recently installed board members were closely linked to Lane and to Apotheker. Image courtesy of Flickr user wilsondan. Saying “early reaction to Whitman as his replacement is mixed” is like saying “scientists are not sure if human activity has been impacting climate change”. On a day when other tech stocks are up, HP is down 5%. The reaction to her hiring has been probably >90% negative. The tech world has lots of experience with bubbles, but most people in that world live outside the bubble that HP’s board lives in. If I had the time, I would research what other companies those directors are involved with, and short them.